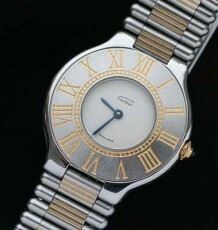 Like new, all-original Cartier bracelet for a Santos steel watch. 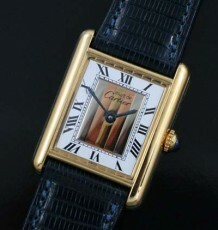 All-original Cartier Santos steel bracelet, like new but actually detailed by the factory service centre. This genuine Cartier bracelet is the ideal replacement for one that is broken or worn out at a fraction of the cost charged by the service centre or a dealer. 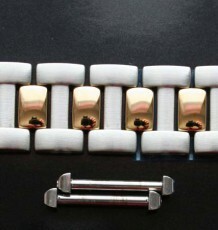 The edges of this bracelet are as sharp as a new model and the screws have not been polished. The bracelet measures 6.5 inches long and is in pristine condition. 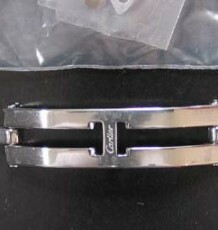 SKU: 414 Category: Cartier Tags: cartier bracelet, Cartier Santos, cartier service centre, genuine Cartier parts, Original Cartier, replacement bracelet.